have you noticed that i am now in oslo, which deserves its reputation as the world's most inexplicably expensive city? * soon after arriving here last week, i discovered that every place worth eating at is closed for the summer, that norwegian grocery stores sell neither sweet butter nor yogurt containing still-living cultures, and that the price of food here is no indication of its quality. on the plus, oslo city water is remarkable. for refreshingness and clarity of flavour, it beats boston's quabbin water and new york city's much-vaunted catskills water handily. copenhagen city water cannot be spoken of in the same breath, as it tastes profoundly flat and forms crusty deposits of lime scale at the slightest provocation. the real gem of norway is Smash! these are crunchy cornmeal and cornflour cones, lightly salted and then dipped in chocolate that appears to be mostly hydrogenated vegetable fat and artificial vanilla. reprehensible, but the balance of crunchy and unctuous, salt and sweet is completely delicious. i have not seen these outside of norway, though they will be a runaway success in japan or the usa. Smash! is also available in a variety of inferior formats including the mini format (tiny Smash! 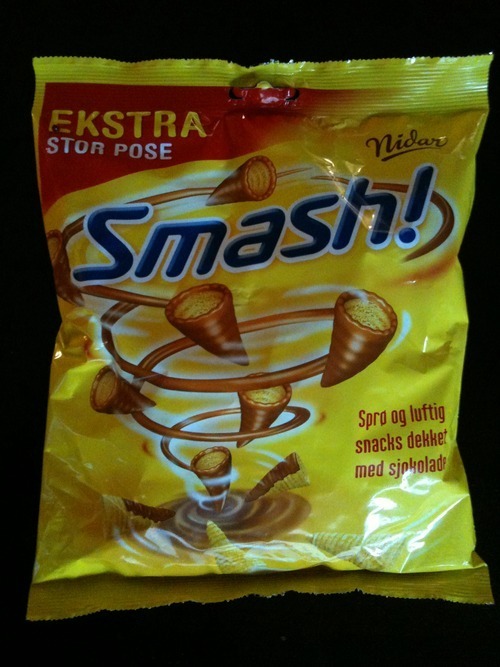 ), the snack mix format (Smash! bits with pretzels), and ice cream format (a giant Smash! filled with ice cream), but the original Smash! is the best Smash! the name doesn't hurt. i recommend buying an ekstra stor pose.